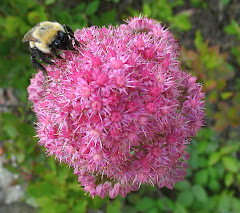 How can it be that a whole week has passed without me posting a blog? 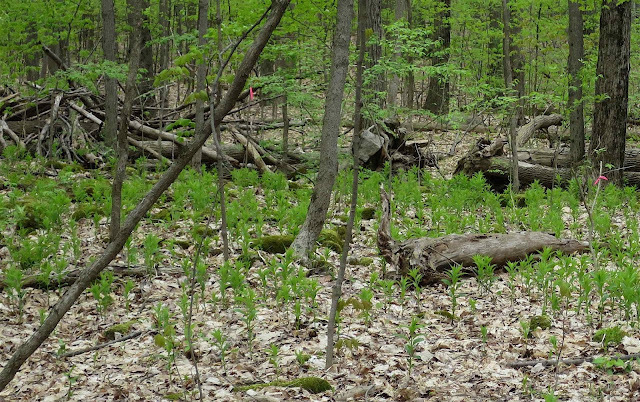 Well, it was a very busy week, and much of it was spent in the Skidmore woods. 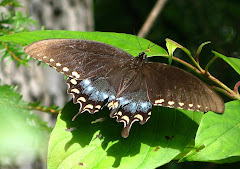 Since I'd promised to lead two nature walks there this past week (one for the Ecological Clearing House of Schenectady and the other for an Audubon chapter), I of course had to go out there to scope it out first. On Monday, I asked my pal Lindsey to join me there. 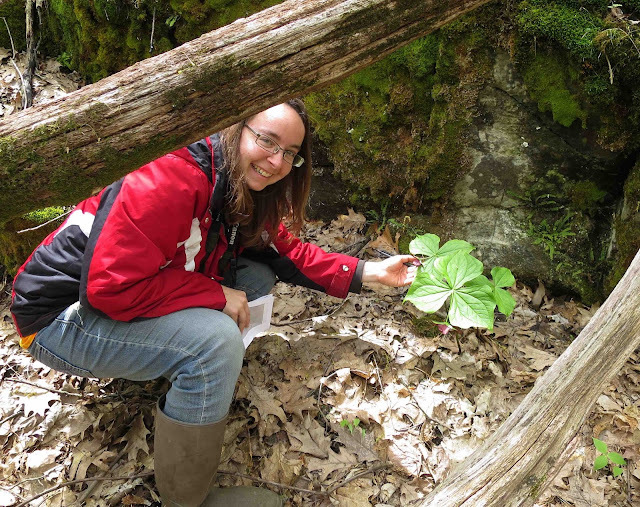 We started our explorations among some large limestone boulders, where we found some Red Trilliums still in fine bloom. 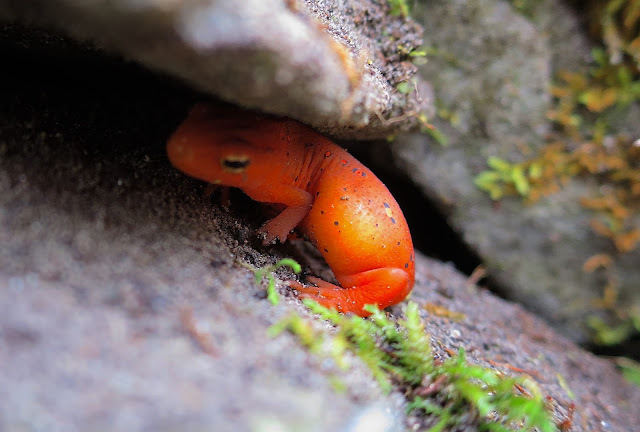 While checking out the plants that grew on the boulders, we surprised this little Red Eft, who scurried to hide in a crack in the rocks. Walking Fern is a very unusual-looking fern, with long spear-shaped fronds growing out of the mossy rock. 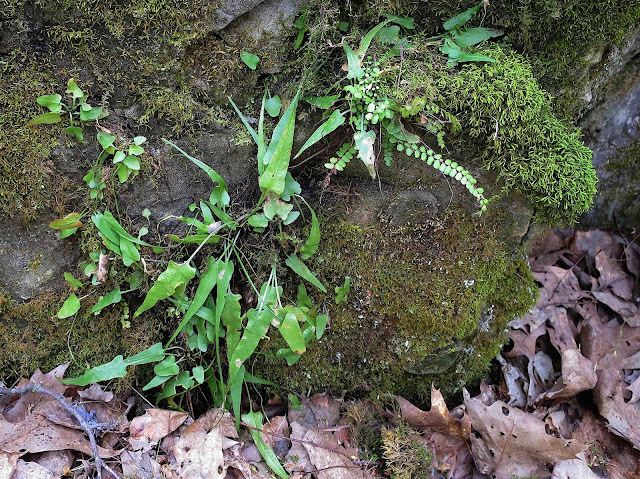 The tiny-leaved Maidenhair Spleenwort also shares these limestone boulders. Both ferns require just such a calcareous substrate to thrive. Crowning one of those boulders was the first of many Jack in the Pulpits we were going to see this day. 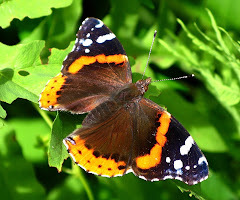 We then moved to one of the main trails through the woods, and I'm going to list here in alphabetical order some of the plants we found along that trail. 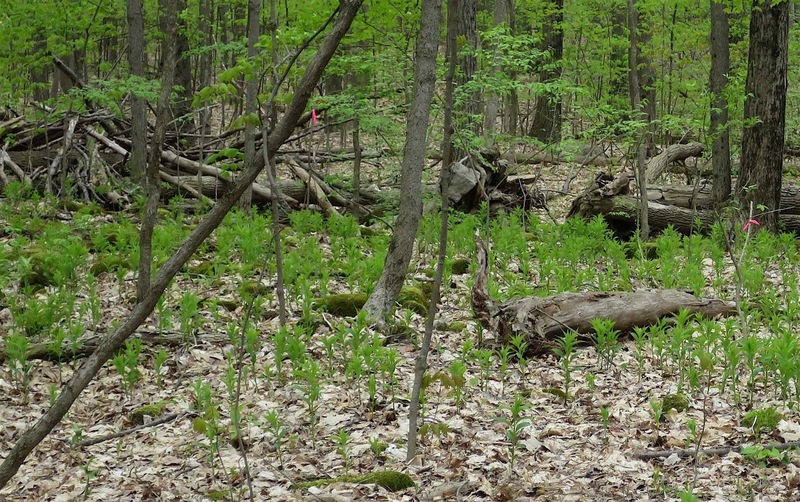 Basswood is one of the large trees that make up this mixed-hardwood/conifer forest. We stopped to marvel at the size and softness of the leaves on a Basswood sapling, and I later found some of these tiny seedlings among the leaf litter. These first sprouts, with finger-shaped seedling leaves that look nothing like the mature leaves, often present a puzzle to folks who wonder what tree they might belong to. 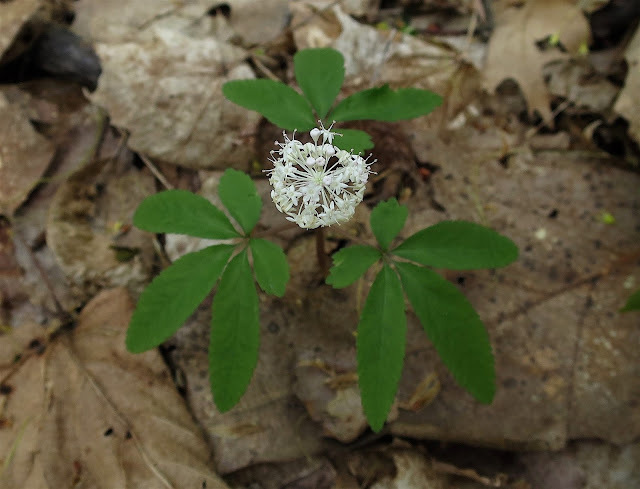 Blue Cohosh was almost done blooming, but we were lucky to find a few hangers-on. 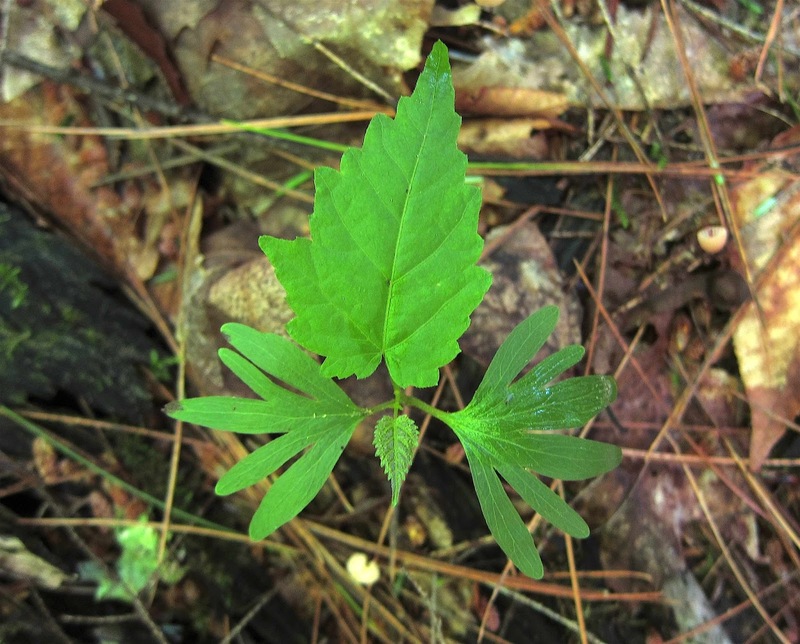 There are two species of Blue Cohosh that grow in the Skidmore woods. 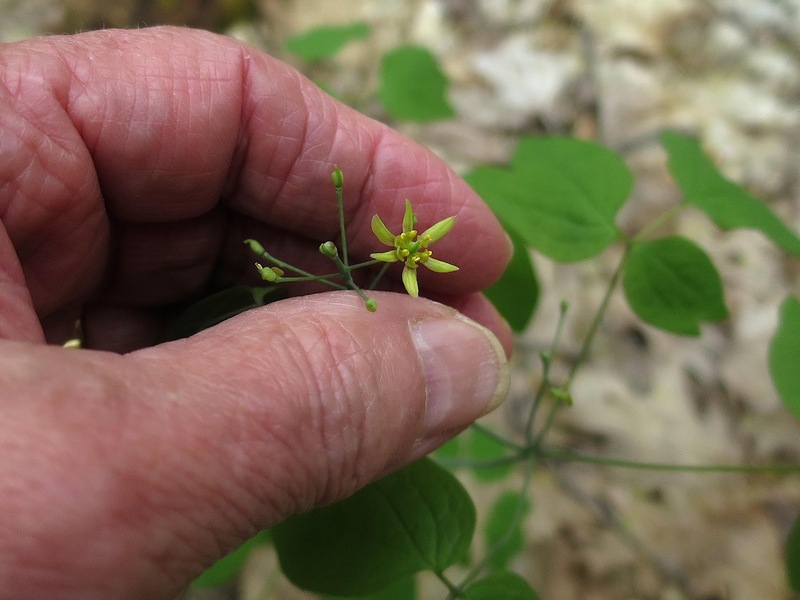 This one, Caulophyllum thalictroides, has yellow-green flowers and is generally a daintier plant than the other species, C. giganteum, that was blooming just across the trail. 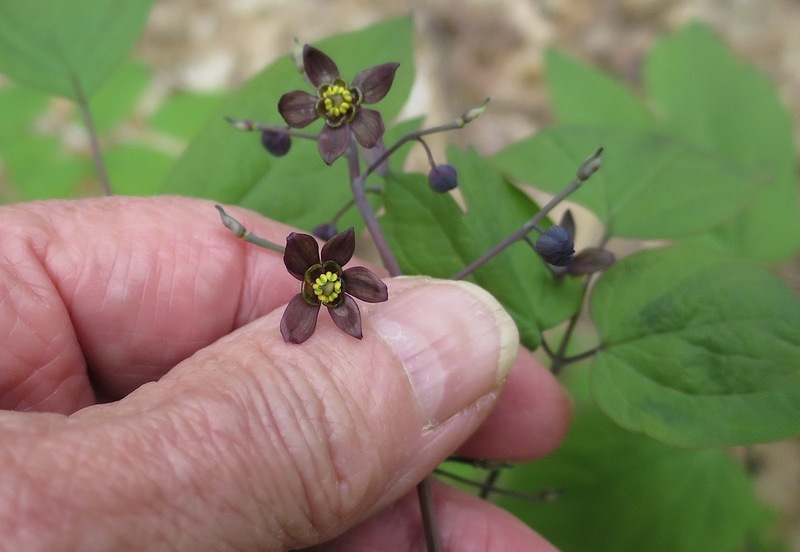 These are the purple flowers of Large Blue Cohosh (Caulophyllum giganteum). Even though these two Blue Cohoshes grow within a few feet of each other, they never appear to hybridize. 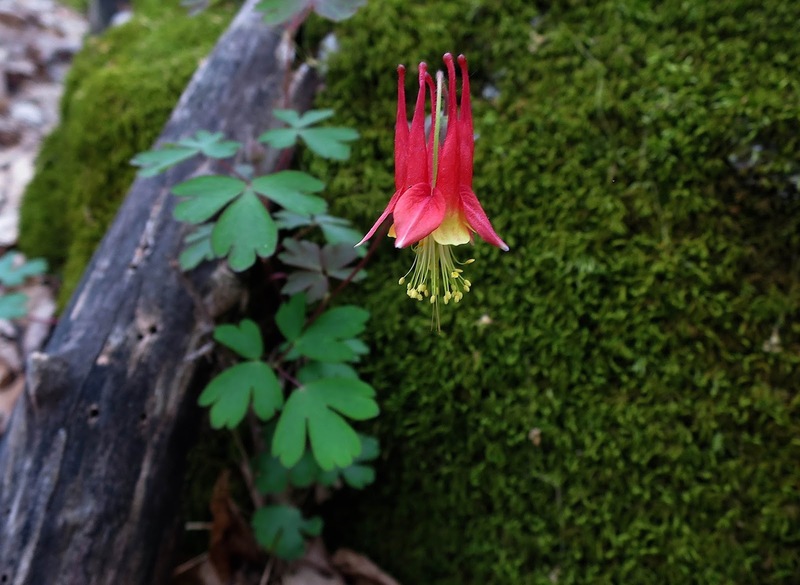 Columbine was easy to spot, with its brilliant red blooms sprouting bright-yellow anthers. 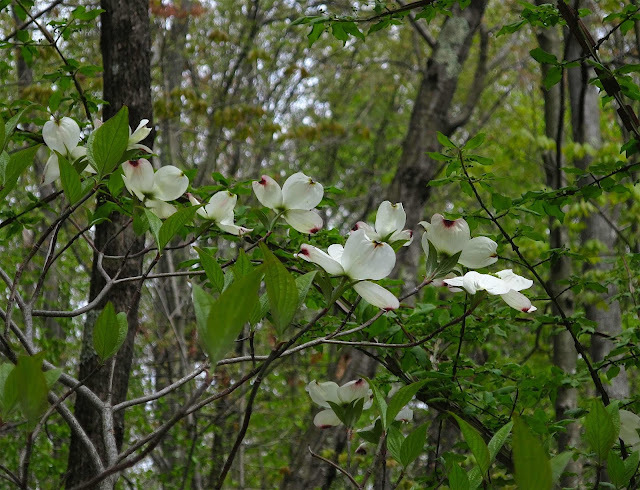 Dogwoods of several species grow throughout the woods, but only the Flowering Dogwood was in full glorious bloom this week. Dwarf Ginseng started blooming some time ago, so I didn't know if we would find it still in bloom. Happily, we did. 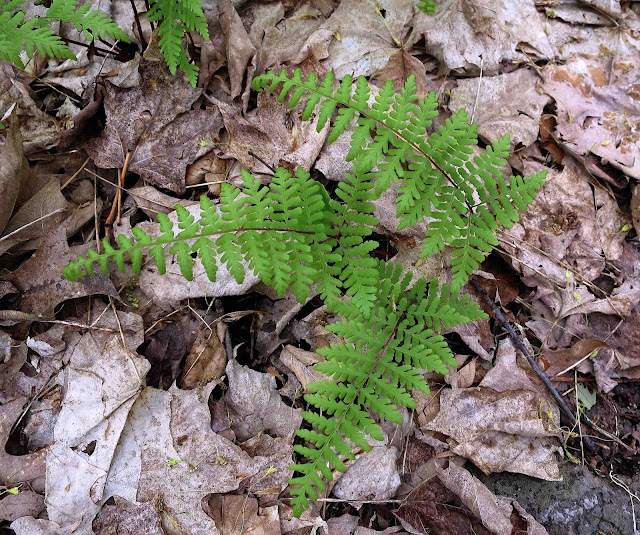 Ferns of many different species thrive in these woods, but this delicate juvenile fern with a red stipe grows only where heaps of rocks are piled up on each other. Although ferns this young are hard to identify, a botanist friend believes these are Bulblet Fern. 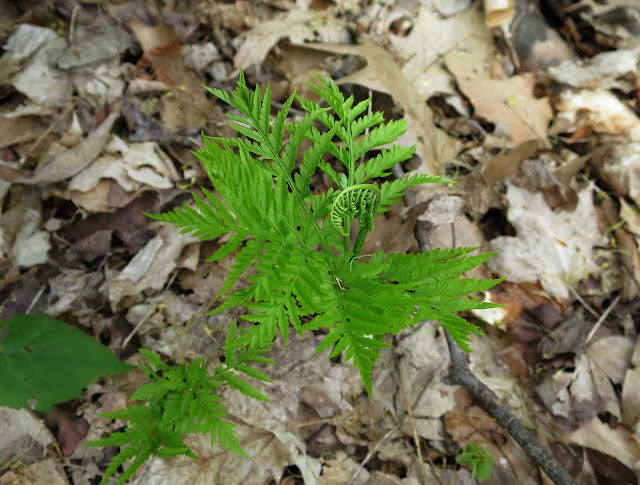 This Grape Fern is quite distinctive, with a separate spore stalk that rises from the center of the fronds. The spores grow in clusters of tiny beads that resemble bunches of grapes. Geraniums grow throughout the woods, and the Wild Geraniums are just now opening their pretty purple flowers. 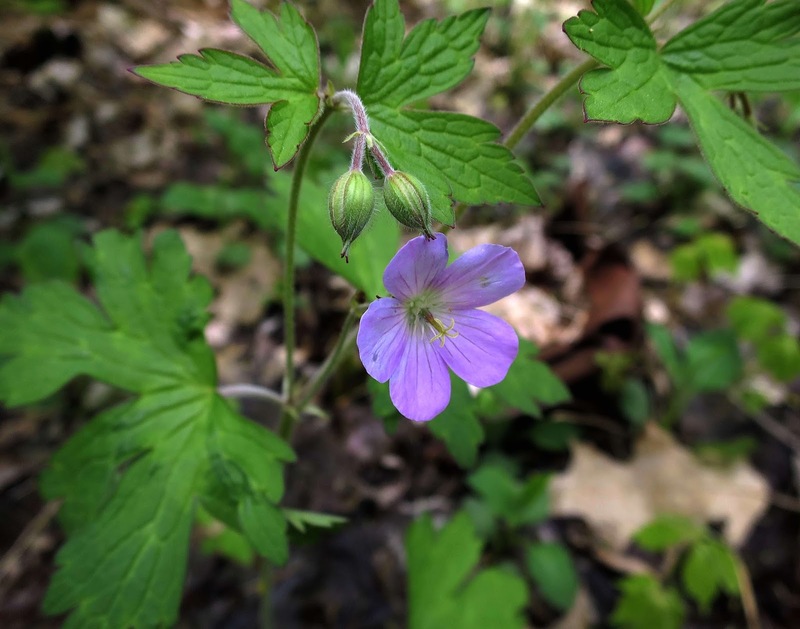 We also found a second geranium species called Herb Robert, which had yet to open its smaller pink blooms. 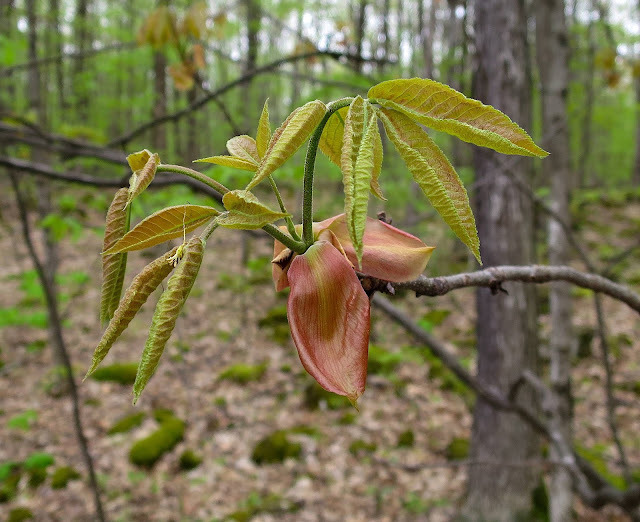 Hickory leaves have erupted from their huge pink bud scales, specifically the pinnate leaves of Shagbark Hickory. 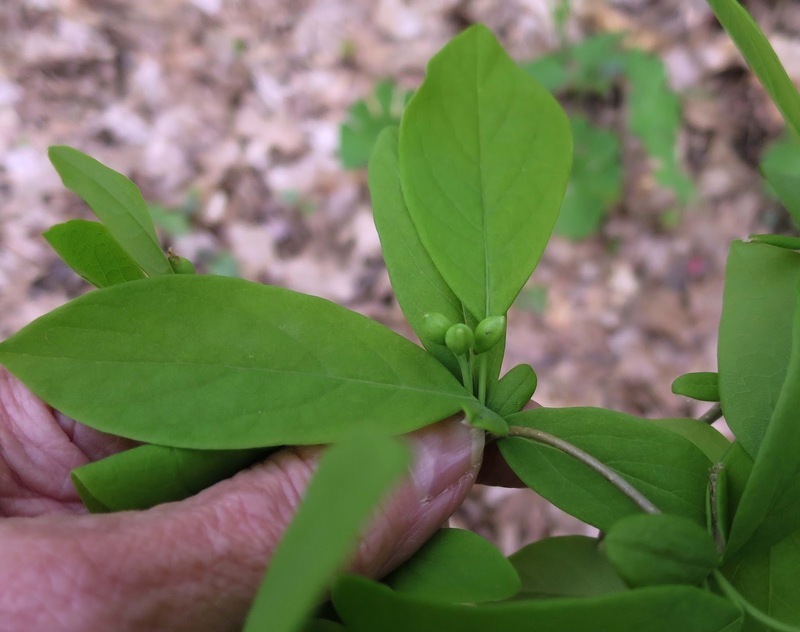 Leatherwood shrubs bloomed early in April, and by now the fruits have started to form. Green now, the berries will eventually turn red. 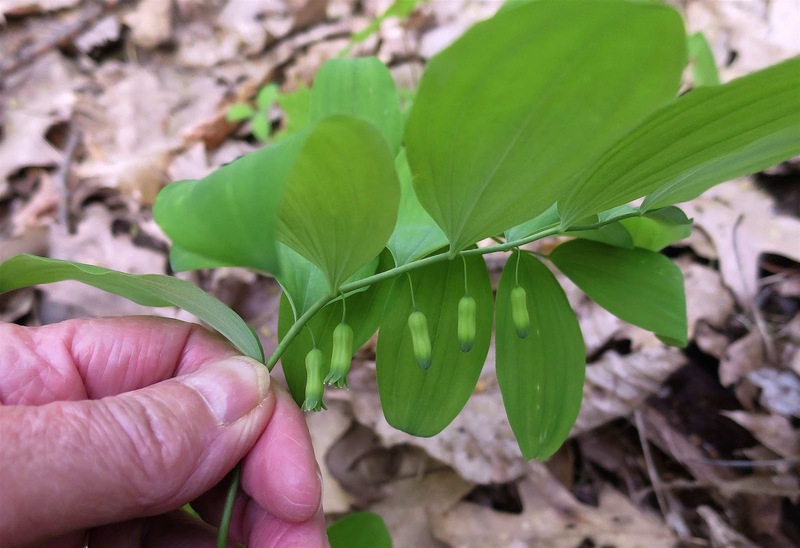 Solomon's Seal dangles these little green flowers from the axils of their soft green leaves. Trilliums truly thrive in the Skidmore woods, especially the Large-flowered White Trillium pictured here, which grows by the hundreds in soils that are rich with lime. 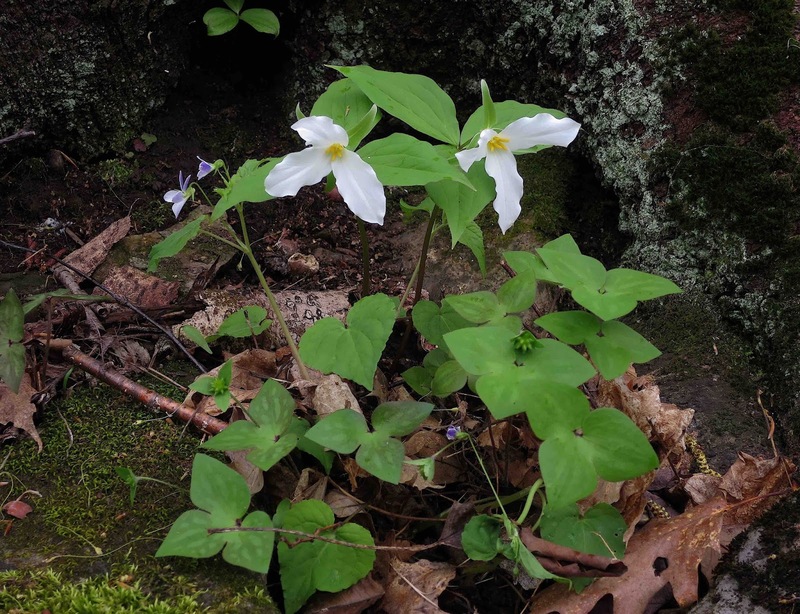 I love that this trillium is flanked by a Canada Violet and a cluster of Sharp-lobed Hepatica leaves, the three plants representing a kind of holy trinity of spring wildflowers found in lime-rich woods. Violets are next, and the Skidmore woods features several violets found only in lime-rich soils. 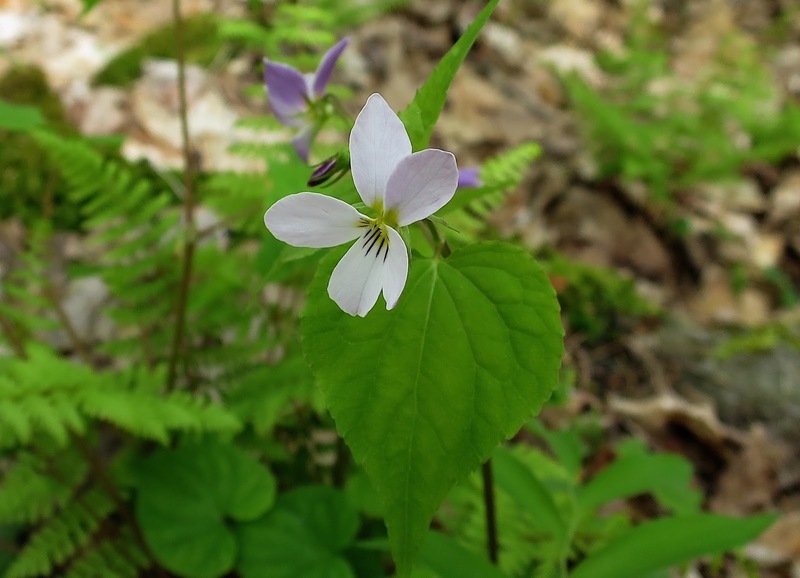 The Canada Violet pictured here is pure white on its face, while the backs of its blooms are tinged with purple. The Green Violet bears hardly any resemblance at all to other plants in the Violaceae Family. Growing to about 18 inches tall, this plant bears in its leaf axils tiny green flowers, which were still in bud early this week. But the open flowers don't look much different than these little green nubbins. I've been told that Green Violet is found nowhere else in Saratoga County except here in the Skidmore woods, where it thrives by the thousands among the limestone boulders littering the forest floor. When we see how it flourishes here, it's hard to believe it's considered a rare plant. 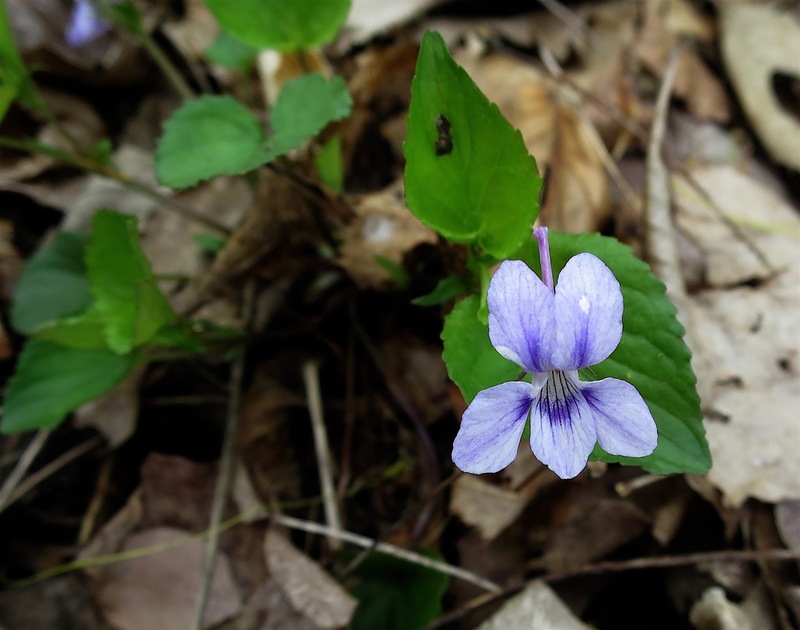 The Long-spurred Violet lives up to its name by sporting a long slender spur. It's also distinguished by the pale purple of its petals that seem to have drained their color to the deeper-hued center. 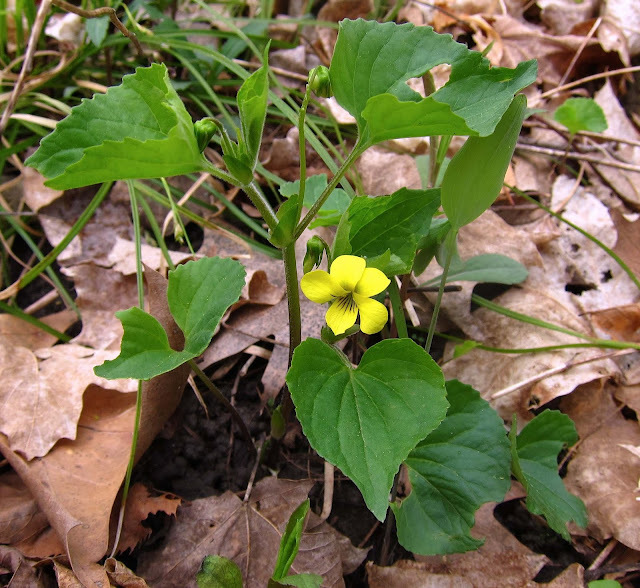 Downy Yellow Violets bloom abundantly in many parts of the Skidmore woods. 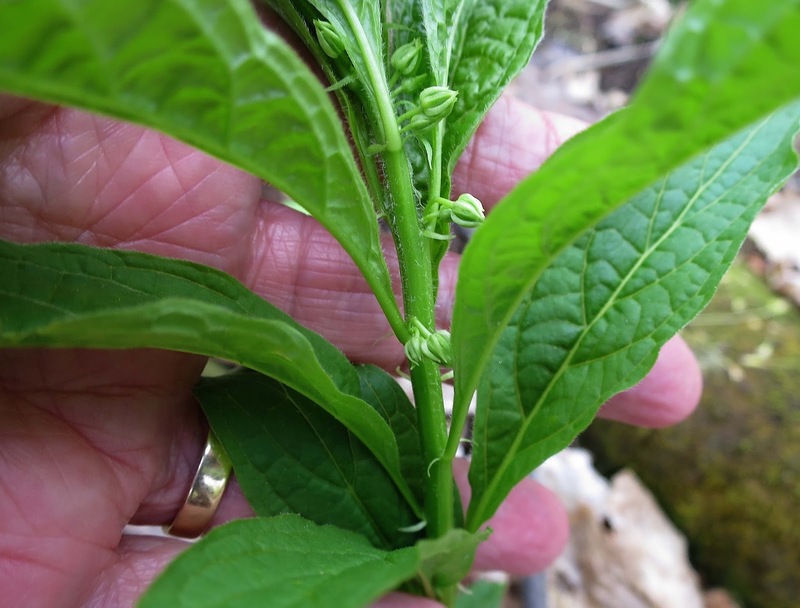 Note that this "stemmed" violet bears both leaves and flowers on the same stem. 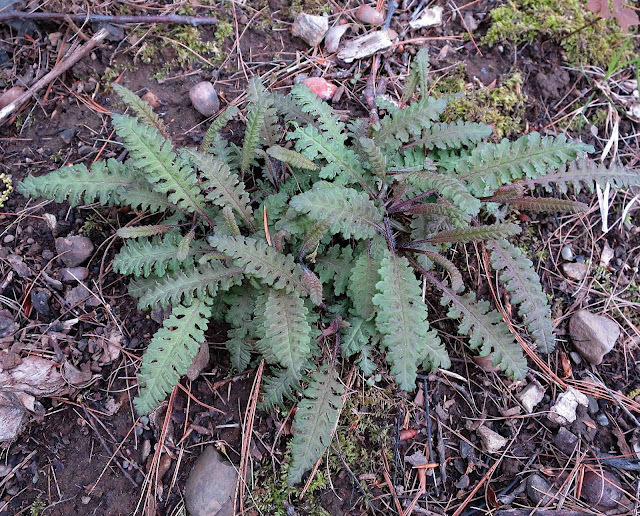 Wood Betony wasn't yet blooming this week, but I think its leaves are quite beautiful in their own right. Wrinkles, I grant, is not the name of a plant. But I was struck by how the bark of this American Beech had seemed to sag into wrinkles around its roots. Unfortunately, most of our beeches are going to die, and not from a wrinkly old age. Rather, these beautiful silver-barked trees are under a two-pronged assault from both an insect and a fungal pathogen. I'm glad we still have a few unblemished stands here and there, including in some isolated sections of the Skidmore woods. You're not that far south, but you have several species we don't see here. 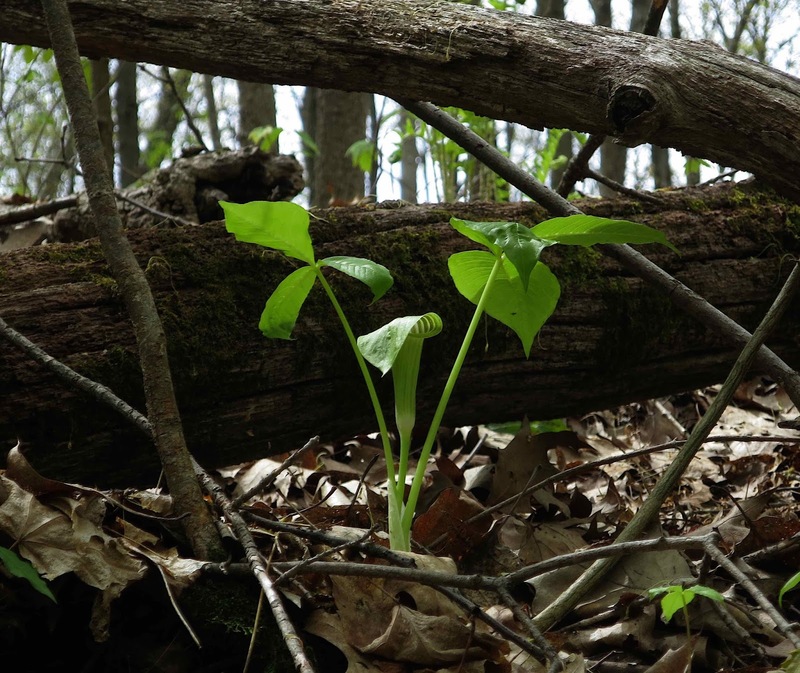 And the season is definitely delayed here, leaves just starting to unfold and Trilliums not out yet. Lovely picture of that big old beech; ours are suffering the same attacks. Hey, I know your friend. Birder extrordinaire. We often run into each other chasing birds. 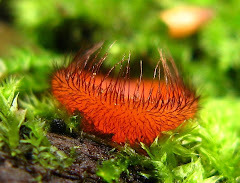 So many wonderful plants and photos. I don't know which I like best, although the hickory leaves are a good bet. Sad about the beeches. I did not know that. Seems are woods are under assault from so many sources. Beautiful photos. 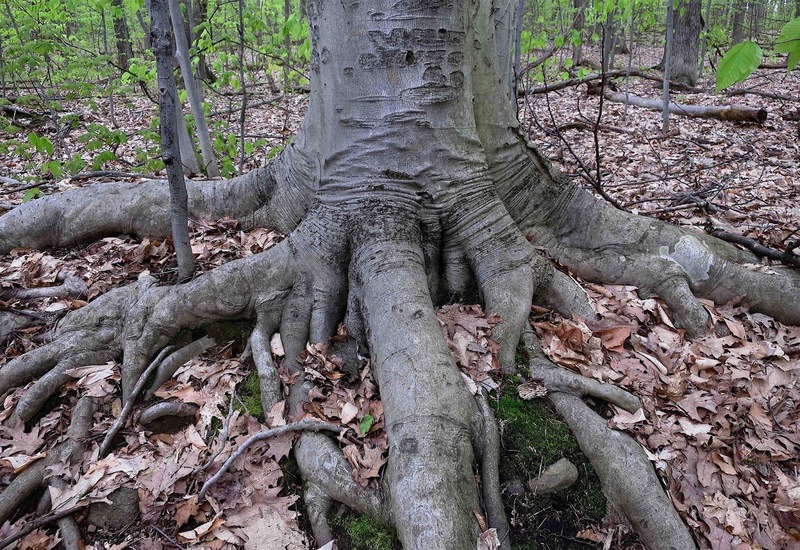 Apparently about ten percent of American beech are resistant/immune to the Nectria fungus that kills so many beech, so you'll always have some beech. Wish the same could be said about white ash.